On September 27, 1839, the battered body of a middle-aged Irishman was found by some Dakota boys washed up along the Mississippi River shore. It was the body of Sgt. John Hays, a popular former soldier, who, prior to his disappearance twenty-one days earlier, had been sharing a log shanty a few miles upriver from the cave with his friend and business partner, Edward Phelan (or Phalen). Before the year was over, Phelan was arrested and charged with the murder of his friend. 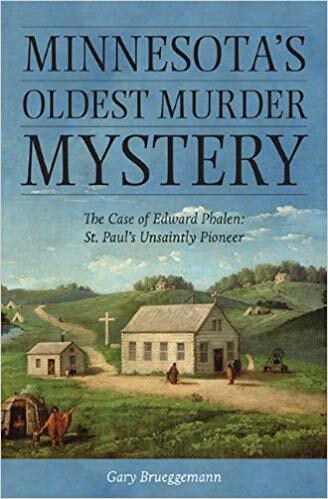 This is the first book to focus on this historic murder and the first thorough biography of Phelan, a notorious pioneer intimately involved in the making of St. Paul and founding of Minnesota. Was he guilty? All reports and records of Phelan’s trial were mysteriously lost and no newspapers covered the story. However, in 1994, St. Paul historian Gary Brueggemann made an amazing discovery in the Minnesota Historical Society archives – hidden in the papers of Joseph R. Brown was his handwritten transcription of the Hays’ murder hearing. Using this record, other primary sources, and drawing from decades of studying Minnesota and St. Paul history, Gary Bruggeman will present the case of Ed Phelan and his trial for the murder of John Hays. The presentation is currently FULL. To be added to the waiting list, please call 651-222-0701 or email membership@rchs.com. See the History Revealed information 2019 page for updates and programs for 2019.